Citation Information: J Clin Invest. 2018;128(1):415-426. https://doi.org/10.1172/JCI95837. Syk plays a dominant role in γδTCR signaling and γδT cell development. (A and B) Flow cytometric analysis of CD3ε and TCRδ expression in thymocytes from the indicated mice at E15.5 (WT, n = 16; Zap70–/–, n = 10; Sykb–/–, n = 8; and Zap70–/– Sykb–/–, n = 2) and on day 0 (WT, n = 19; Zap70–/–, n = 4; Sykb–/–, n = 7; and Zap70–/– Sykb–/–, n = 8). The total number of thymocytes is indicated above each flow cytometric plot (A). Graphs indicate the total number of γδT cells per mouse (B). 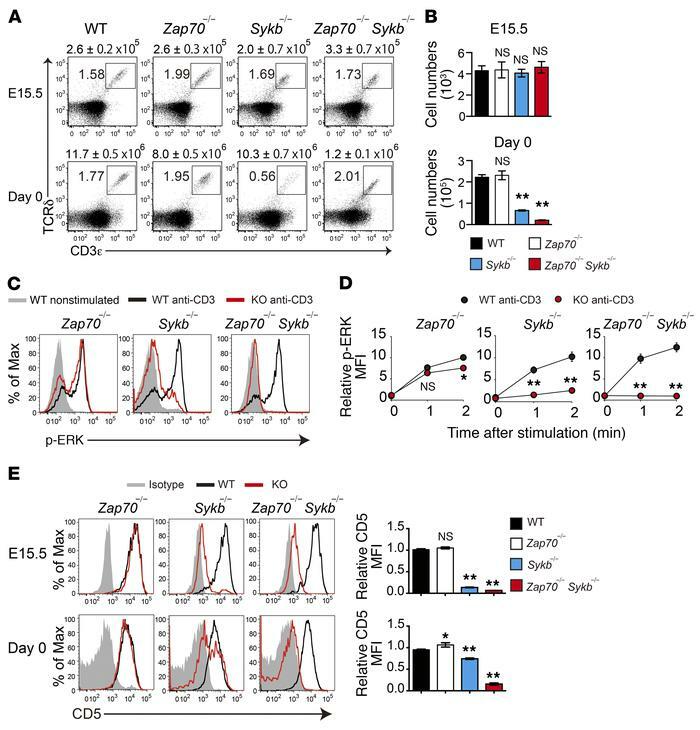 (C and D) TCR-induced ERK phosphorylation in thymic γδT cells from the indicated mice on day 0 (Zap70–/–, n = 3; Sykb–/–, n = 4; and Zap70–/– Sykb–/–, n = 3). Histograms indicate p-ERK levels after a 2-minute stimulation (C). MFI relative to the nonstimulated control (D). (E) Histograms show CD5 expression in thymic γδT cells from the indicated mice at E15.5 (WT, n = 13; Zap70–/–, n = 10; Sykb–/–, n = 9; and Zap70–/– Sykb–/–, n = 2) and on day 0 (WT, n = 17; Zap70–/–, n = 3; Sykb–/–, n = 7; and Zap70–/– Sykb–/–, n = 5). Graphs indicate the MFI relative to WT mice. All data represent the mean ± SEM. *P < 0.05 and **P < 0.01, by 1-way ANOVA (B and E) and 2-way ANOVA (D). Data represent the combined results of 3 independent experiments (A, B, and E) or a single experiment (C and D). Max, maximum.